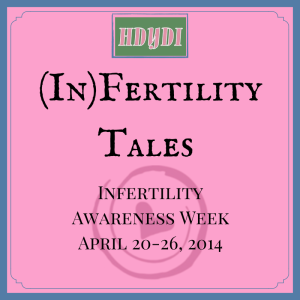 Infertility Tales 2014 | How Do You Do It? Resolve to know more about the personal cost of infertility. April 20-26 is Infertility Awareness Week. Infertility is part of many of a mother of multiples’ story. Those of us who have survived these struggles to become parents know well the pain that so many continue to contend with. In this theme week, we invited regular HDYDI contributors and readers alike to share the stories of how they came to be parents… even though it sometimes seemed impossible. 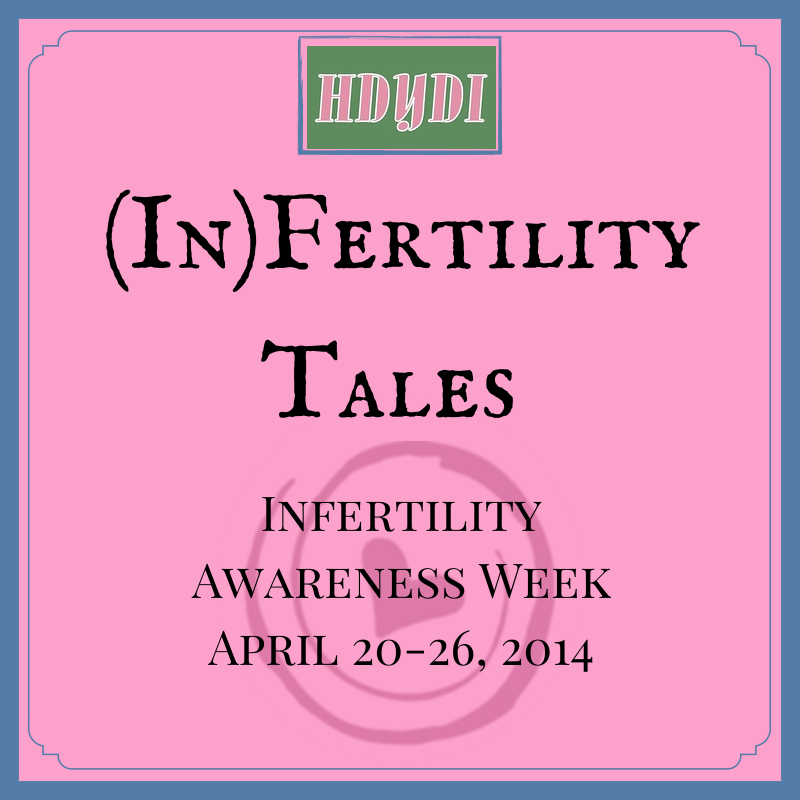 Welcome to Infertility Tales 2014: Why we’re even doing this theme week. Infertility Blog Link Up: An opportunity for bloggers to share their infertility-related posts. From the Archives: Infertility: The topic of infertility has been covered before on HDYDI, although never in such a concerted effort as this week. This post lists our archival posts on the topic. Infertility Terminology: From ART to FSH, from IVF to IUI, from PCOS to SPA, navigating the terminology of infertility can be a daunting task. This post outlines many of the most common terms. Sadia’s Perspective — On the Outside Looking In: What Infertility Means: As the coordinator for HDYDI, Sadia talks about the compassion she has for those for whom infertility is part of our journey, acknowledging that she can never truly know what it’s like to walk in those shoes. On Anonymity and Infertility: Some of the week’s stories are published anonymously. This MoM talks about her [sometimes conflicted] decision to remain anonymous, despite wanting to fight the taboo surrounding the subject of infertility. Martha’s Story: Miscarriage, Blocked Fallopian Tube and IUI: Reader Martha had her now 9-year-old twins after a heartbreaking miscarriage. Stacey’s Story: Coping with Infertility: Stacey of Perfectly Peyton shares her story of infertility, and how she found strength in finally sharing her journey. Clare’s Advice: 14 Things Your BFF Would Tell You About Fertility Treatment: The Super Mommy Blog’s Clare shares the 14 things she’d tell her BFF about fertility treatment. Helene Tells All: The Honest Truth About the Process of Becoming a Mother: In her signature tongue-in-cheek style, HDYDI author Helene pokes a little fun at some of the ups and downs of her fertility journey. Angela’s Perspective – Honoring Moms Who Aren’t: Remembering the Bereaved or Infertile: Angela shares this beautifully written perspective on the many stages of the journey through infertility. Succeeding to Fail: The Hope and Pain of Infertility, a His- and Her- Perspective: Infertility can bring about a roller coaster of emotions. Candace and Chris of Our Misconception express the highs of hope and the depths of pain in this post, written in the middle of their journey. Mandy’s Story: Conceiving Despite Male Infertility — Working as a Couple: MandyH of Hoping for Hoberts shares her perspective of the fertile half of an infertile couple: the complex emotions of that relationship between husband and wife and the miraculous stroke of fortune that brought about her twin daughters, in the moment they thought all hope was lost. Christina’s Story: The Six-Year Journey to Motherhood: Christina‘s road to motherhood took 6 years. She gives us an up-close-and-personal view into what it took for her precious girls to get here. Helene, on Being “Cautiously Optimistic”: Helene shares her heart in this post. She tells us why the phrase “cautiously optimistic” is one she came to dread hearing, from even the most well-meaning member of her medical team. The Two-Week Infertility Cycle: The hope, the worries, the fears, the stress. Every twinge, every cramp, every 0.10° change in basal body temp. Everything is magnified when you’re living your life in two-week cycles, hoping beyond hope for good news. The Roller Coaster of Emotions: The Things that Hurt When You’re Infertile: Most of us never stopped to consider how much “baby stuff” we see every day… UNTIL we’re trying to conceive, and can’t. It’s everywhere, and when you’re infertile, it hurts. In this post, submitted anonymously, the author shares the pain she felt. Bree’s Story: Triplets After IVF, pPROM and TAC Surgery: “While my path isn’t known by all, I’m hoping my voice will be one of the many that will change that. The topic shouldn’t be taboo – yet it is.” Bree shares her decade-long infertility journey…and a picture of her miracle baby boys, born almost a year ago. Kristin’s Story: From Endometriosis to IVF Quadruplets: Kristin’s story began with a routine exam, her doctor even suggesting that she might have cancer. Fortunately, it was “just” endometriosis, which led Kristin down the path of infertility. She tells the story of finally having three viable embryos, and introduces us to her eight-year old quadruplets. My Story: Our Infertility Journey, Complete with ICSI: From the discovery of male-factor infertility to having an almost-two year old and an almost-five year old: this author shares her journey, including the online support group that helped her through the long process it took to become a parent. My Story: Taking Our Infertility One Step at a Time: Forcing herself to set her Type A personality aside, this author shares the step-by-step approach that helped her cope with her infertility journey. A Support System to Help You Through Infertility: Infertility can seem like a very lonely journey. This MoM talks about the amazing support she received from an unexpected source, and how that experience still impacts her today. How to Support an Infertile Friend… When You’re Not: On the outside looking in? Tips here from Sadia — with weigh-in from many of the MoMs of HDYDI — on how to support someone dealing with infertility. Buy One, Get One Free: Affordable Fertility Treatment! : You’ve heard stories of long, arduous, and expensive battles with infertility. This mom shares her encouraging story. Her treatment was relatively inexpensive, especially when she considers her “buy one, get one” deal! “Legitimately” Infertile? : Most would say there are no depths of pain and heartache. Hurt is hurt. It is real. This mom struggles with whether she should be classified as “legitimately” infertile, given it “only” took her 10 months to conceive, which she ultimately did via IUI. Liz Wonders: Why Was She Crying? : In this gripping commentary, Wishing on a Snowflake‘sLiz talks about how the various stages of her life have impacted how she looks at others. Infertility has further colored that lens. Infertility: It Still Affects Me: Even years after giving birth to precious twins, this mother feels the stab of being infertile when she sees pregnant women. The effects don’t just go away. Angela’s Letter to Her Infertile Self: Looking back now on her journey through infertility, Angela writes a letter to her infertile self…one of grace and compassion and hope…a lesson for us all, no matter our course. Baby-Maker’s Guilt: The journey through infertility is not uncommon in the world of multiples. Sadia recognizes that her easy path to conceiving spontaneous twins stands in stark contrast to that of many other MoMs. Lea’s Story: From Infertility to Adoption: Unlike the planning she’d been doing through years of infertility, LeaTheBlogger’s adoption came about quite suddenly. Neither road was easy, but they are now blessed with two amazing girls. Nichole’s Story: The Path to Adoption: By every definition, Nichole is a master planner. Her journey to motherhood through adoption taught her that there are some things you just can’t plan for…and how there are often bigger plans in store for us than what we ever could have imagined. Selective Reduction: Two Women, Two Views: Selective reduction isn’t something society likes to talk about, but it’s a real thing. It’s a real conversation that happens in pretty much every high-risk OB’s office or with the mother carrying multiple babies. Here, Angela (Bickford) and A Mother to One‘s Shelby present two sides of that conversation…with the middle ground that we all deserve support for having made the choice we feel is right for our individual families. Candace and Chris, Continued: Our Misconception on Surrogacy: After seven long years of infertility, Candace and Chris of Our Misconception turned to surrogacy to achieve their dreams of parenthood. They are beyond thrilled to have a very pregnant gestational carrier! They look forward to beginning the next chapter of their lives as they welcome their long-awaited miracle into the world. Pingback: Call for Stories: Tell Your Infertility Tale - How Do You Do It? This isn’t my story but it was written by a friend and with permission put on our blog. Thank you so much for sharing that!! We’ll add it to the linkup once it’s up. Pingback: Last Call for This Year's Infertility Awareness Week Contributions - How Do You Do It? Pingback: Infertility Blog Link Up - How Do You Do It? Pingback: Clare’s Advice: 14 Things Your BFF Would Tell You About Fertility Treatment - How Do You Do It? Pingback: Christina's Story: The Six-Year Journey to Motherhood - How Do You Do It? Pingback: My Story: Our Infertility Journey, Complete with ICSI - How Do You Do It? Pingback: A Support System to Help You Through Infertility - How Do You Do It? Pingback: Infertility: It Still Affects Me - How Do You Do It? Pingback: "Legitimately" Infertile? - How Do You Do It? Pingback: Baby-Maker’s Guilt: Spontaneous Conception in an Infertile World - How Do You Do It? Pingback: Lea’s Story: From Infertility to Adoption - How Do You Do It? Pingback: Nichole’s Story: The Path to Adoption - How Do You Do It? Pingback: Selective Reduction: Two Women, Two Views - How Do You Do It? Pingback: Relaxation Does Not Cause Pregnancy - How Do You Do It? Pingback: What Lasts: Carter’s Song - How Do You Do It? Pingback: Liz’s Story, Continued: Expecting After Embryo Adoption, There Are 10 Things I Didn’t Expect - How Do You Do It? Pingback: Why Are Multiple Mamas Just So Nice??? - How Do You Do It?